Successful companies and organizations in all fields use project management to achieve breakthrough results. The powerful and versatile tools of project management are transferable to any work environment around the world and can be used to manage any project, no matter how complex. In addition, project managers earn excellent salaries. To be a successful project manager, you need to understand business requirements and also know how to effectively plan, organize, control and lead a project through its entire life cycle. This certificate gives you hands-on experience with practical tools, including the use of software, risk assessment and team techniques that support effective project management. It is also a great starting place to fulfill the requirement of project management education hours for the Project Management Institute’s (PMI®) Project Management Professional (PMP®) designation. Read about students' experiences in a recent Dover Project Management Certificate class. 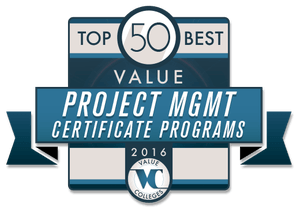 UD’s Project Management Certificate is ranked #13 on the ValueColleges.com national list of the most trustworthy programs that will deliver a solid return on your investment. You may also be interested in Project Management Exam Prep: PMP/CAPM. To earn the Project Management Certificate, you must complete each module with a passing grade and earn a “C” or above as the course grade. Meet the education requirements for your Project Management Institute (PMI®) credential. Acquire practical, use-it-next-day skills to manage any project, large or small. Get hands-on experience using powerful, versatile tools to keep your projects on track, on time and on budget. The Project Management Professional (PMP) credential is the most important industry-recognized certification for project managers. Globally recognized and demanded, the PMP demonstrates that you have the experience, education and competency to lead and direct projects. The PMP credential is offered through the Project Management Institute (PMI®). This program is an excellent starting place to attain the Project Management Institute’s (PMI®) Project Management Professional (PMP®) designation, which remains the global standard for professional project managers. The Project Management Institute was the first organization to offer a credential specifically for project managers, and continues to be one of the world’s largest professional membership associations. With half a million members and credential holders in more than 185 countries, it seeks to advance the project management profession through globally recognized standards and certifications, collaborative communities, an extensive research program, and professional development opportunities. Learn more about the top 11 benefits of attaining the PMP® credential. There are no academic prerequisites for this program. Project managers can come from virtually any educational or experience background. Project managers have to be able to understand and communicate both the technical and business cases for a project. Access to a computer (PC or MAC) with internet access is required for this course. A laptop is preferred. "This course introduced me to Microsoft Project, which I find to be a very useful tool." A 15% discount available to graduates of UD undergraduate and graduate degrees, UD certificate programs and Professional and Continuing Studies noncredit programs; as well as current matriculated UD students (part-time or full-time). Please call 302-831-7600 for the coupon code. Only one discount can be applied to any individual registration. All members of the Project Management Institute Delaware Valley Chapter are eligible for a 10% discount. To take advantage of the discount, PMI Delaware Valley Chapter members need to call 302-831-7600 for more information. Only one discount can be applied to any individual registration. A 15% discount is available to active members of the military as well as veterans. A copy of your DD-214 form is required to qualify for the discount. Please email the form to continuing-ed@udel.edu. The coupon code will be emailed upon receipt of the form. Only one discount can be applied to any individual registration. Enroll two or more people from your organization in a noncredit program and benefit from a 15% reduction in the total cost of registration. Both individuals must register at the same time and be employed by the same organization. Please call 302-831-7600 for more information or to take advantage of this discount. Only one discount can be applied to any individual registration. Ron DeLuca, MCPM (Master Certified Construction Project Manager), and PMP (Project Management Professional), is Director for the University of Delaware's Project Management Certificate Program and has served on the PMI-DVC (Project Management Institute-Delaware Valley Chapter) Board of Directors as Vice President of Education and Development. For several years, Ron has taught corporate outreach project management training programs for pharmaceutical, informational technology, government and not-for-profit organizations. He teaches Project Management at Temple University Fox School of Business, and for the National Association of Home Builders, including the American National Standards Institute (ANSI) courses, sanctioned by the American Institute of Architects (AIA). He is a licensed instructor for the Pennsylvania, New Jersey and Delaware Real Estate Commissions, and the Pennsylvania Board of Certified State Appraisers. Ron is President and founder of DeLuca Project Management & Associates, Inc., a company specializing in Project and Construction Management. After securing financing at 21.99%, he completed his first speculative major building project in 1983. Since then, his projects have been showcased in publications, including a front cover story of Builder/Architect Magazine. He has been a featured guest on radio and television, and consults as an expert witness concerning construction liability cases for the TASA Group. He was elected President of the Builders Association of Chester and Delaware Counties in Pennsylvania and has served on the Board of Directors at both the state and national levels. Toni Bush Neal is a Project Management Professional (PMP) with over 23 years of experience in successfully developing and driving the execution of projects for both private- and public-sector companies. In addition to being certified in project management, Ms. Bush Neal is certified in change management and performance measurement and earned certificates in Lean Six Sigma, Balanced Scorecard, and Program Management. She is a valued advisor to executives and business leaders and a passionate higher education professional who teaches business strategy and project management. Ms. Bush Neal currently serves as a trustee for the Delaware Art Museum and serves on the board of the Wilmington Senior Center. She has also served as a board member for the Delaware State Board of Architects, Trustees of Color, and Dress for Success Delaware. Ms. Bush Neal holds a BS in Computer Science from the University of Delaware, an MBA from Pennsylvania State University, and has completed post-graduate studies at Harvard University and The Wharton School of the University of Pennsylvania.